Shown below are a list of OpenTherm capable / compatible manufacturers and boilers. These OpenTherm Boilers / OpenTherm capable boilers have integrated OpenTherm unless specified otherwise in brackets. For more info on “What is OpenTherm?” at the OpenTherm Association. You can also see our OpenTherm Capable Controls shown further down the page. Wikipedia: OpenTherm (OT) is a standard communications protocol used in central heating systems for the communication between a central heating boiler and a thermostatic controller. A two way communications interface, usually in the form of a slave and master device. As a standard, OpenTherm is independent of any single manufacturer. A controller from manufacturer A can in principle be used to control a boiler from manufacturer B. However, OpenTherm controllers and boilers do not in fact always work properly together. The OpenTherm standard comprises a number of optional features and some devices may include manufacturer-specific features. The presence or absence of such features may impair compatibility with other OpenTherm devices. OpenTherm was originally created by Honeywell and was sold to the OpenTherm Association on November 1996 for one British Pound. This was no doubt to make the standard independent of any manufacturer. 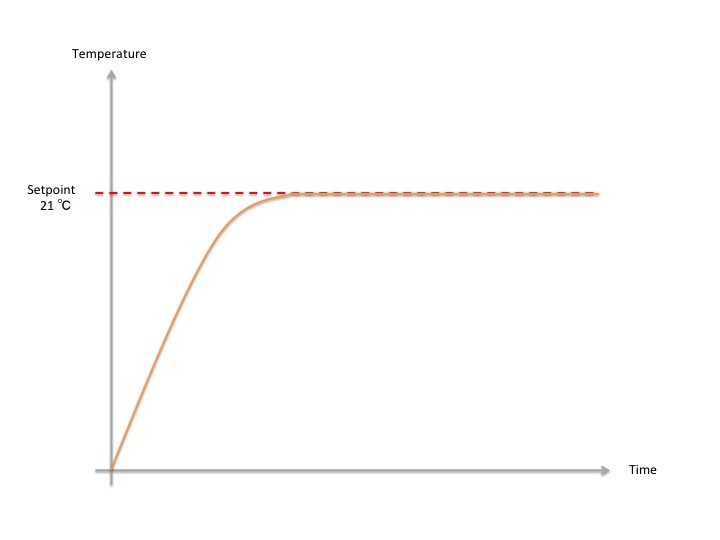 Unlike room thermostats that simply tell the boiler when to turn on and off (non modulating graph below) , a modulating control (see modulating graph below) tells the boiler the exact target / set point temperature that is required to be achieved. 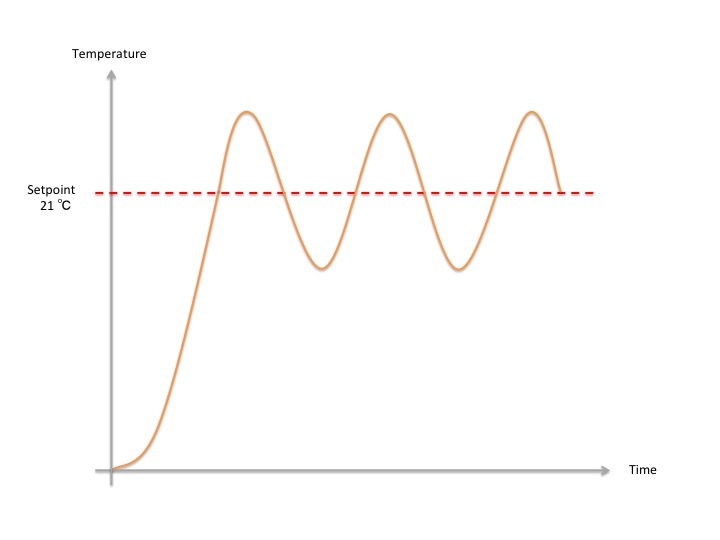 So as the current temperature starts getting closer to the set point temperature, the boiler starts reducing the flow temperature to match the required demand. OpenTherm is easier to use on combi boilers. The reason for this is that there is no hot water cylinder to worry about, heating to the correct temperatures as required by legionalla prevention(recommended 60 degrees), as OpenTherm can reduce flow temperatures to below 60 degress. So, on system and regular boilers that have opentherm, in order to also work with hot water cylinders, cylinder temperature reporting must be present in some form. This allows the OpenTherm to fire at high temperature just for the hot water. Note, is is advised that in this setup there is priority to the hot water system, otherwise higher temperatures may reach the radiators when you don’t want them to. Main Eco Compact Combi 25-30 Same accessories as Baxi. The following boiler models, mostly Vaillant and Worcester Bosch are capable unofficially. Using the mentioned adaptors may invalidate your warranty. However boilers that are out of warranty will have no known problems, as these adaptors are purpose made by the companies themselves for some European countries, where governments have made it compulsory to have OpenTherm. Ecotec 4XX Series requires additional steps. [í_í_] Manufactured after 16th January 2007 with software version CF12.10 onwards. [^] Manufactured after February 2011. Following are a list of OpenTherm compatible controls. These controls are compatible with Open Therm Capable boilers shown above. Smart Thermostats are listed first. Where an addition tranceiver is required it will be specificied in the brackets. See more info on OpenTherm at the OpenTherm Association.For homeowners: what OpenTherm means see the following post: What is OpenTherm? Review Page / Info page. Honeywell T4M Wired Y N N optional WC curve setting and internal reference - no support for DHW setpoint. Honeywell T4R Wireless N N N no support for DHW setpoint. Honeywell Lyric T6 Wired Y Y Y support for DHW setpoint and overnight preheat disable for combi boiler applications. Honeywell Lyric T6R Wireless Y Y Y Support for DHW setpoint and overnight preheat disable for combi boiler applications. Honeywell T6R-HW Wireless Y Y Y Support for DHW setpoint and overnight preheat disable, plus timed hot water control for storage combis and system boilers. My boiler is a Vitodens 100-W Type B1HA, B1KA, 6.5 to 35Kw Wall mounted condensing boiler. It is not on your list of OT compliant boilers. The installation instructions suggest that it is compliant and I am hoping you can confirm one way of the other. Excellent article! In your ”unofficially compatible” list sits my Glow-worm Ultracom, which you mention will require an adaptor. Apologies if I’ve missed it within the above, but do you have any more info/links to such adaptors? The Climapro2 controller we currently use is starting to play up so I’m looking at alternatives. Thanks, Andy. Have a look at the following article Vaillant Opentherm/, as the Vaillant and Glowworm share the same PCB they use the same adapters. Most likely for the Ultracom is the VR33 0020017895 / equivalent AWB 0020092426 or the AWB OPENTHERM MODULE 0020036768 for certain Glowworm Boilers. Search these parts and look at the inside of your PCB housing to determine which is the correct one. Hope that helps. Hi i have recently installed a Baxi Platinum combi which does not appear on any of your lists? I know this is a modulating boiler but i’m not sure if this means its opentherm compatible. Can you please confirm if this boiler is able to use opentherm? Hi, the Baxi Platinum boiler is not OpenTherm compatible. Most modern condensing boilers are internally modulating ie room controls ask a boiler to come on off, the boiler determines it’s own power level. Where as an opentherm boiler is told by opentherm controls what powerlevel it should be at. Hope that answers your question. Do you know whether the Ideal Combi ESP1 35 supports Opentherm ? Boiler added to list, credit given to you for help.